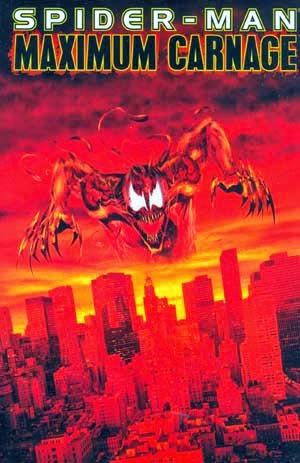 The series featured Spider-Man, Venom and a host of other superheroes teaming up to take down the offspring of the alien symbiote, the murderous Carnage and his team of super villains. The story arc brought Spider-Man together with Venom, one of his most hated villains in mutual cause to take down Carnage, a murderous psychopath given the powers of the symbiote. Carnage recruits many villains to his cause including Shriek, Demogoblin, Doppleganger, and Carrion; Carnage dubs himself their father and they proceed to go on a violent, bloody killing spree in Spider-Mans back yard. Spider-Man and Venom are not alone in their quest to take out Carnage though; they are joined by Captain America, Black Cat, Nightwatch, Cloak and Dagger, Iron Fist, Deathlok, Morbius, and Firestar. The team dynamic works well over the course of the story as Eddie Brock and Peter Parker take two very different approaches to defeating Carnage, all working up to a spectacular yet bloody finale. The series began in Spider-Man Unlimited #1 then worked its way through the Spider-Man series, from Web of Spider-Man #101, Amazing Spider-Man #378, Spider-Man #35 and so on, wrapping up in the fourteenth part in Spider-Man Unlimited #2. The entire series was collected as a trade paperback in September 1994 and then was reprinted in January 1995. The series was also used as the basis for Sega’s 1994 video game, Spider-Man & Venom: Maximum Carnage which was released for the Sega Genesis and Super Nintendo and is still one of the best adventures of Spider-Man in video game form. This story arc is one of the greatest in Spider-Man’s run with Marvel Comics and is one of the most read. Peter is at a tough time in his life having just having lost one of his best friends, Harry Osborn. It shows Peter being forced to make hard choices its even worse that he’s being that he is forced to team up with one of his biggest enemies in Venom to take down an even bigger threat in Carnage. On top of that, this run is one of the bloodiest as Carnage does not hold back or have any qualms about murdering innocents in harsh and brutal ways. So if you are looking for another decent comic storyline to follow up our previous posts of Death of Superman and Green Arrow: The Longbow Hunters, give the Maximum Carnage story a read. It is sure to impress, and bring you back to your friendly neighborhood Spider-Man.